Turkey and Russia need to continue working together to pursue the cease-fire in Syria, Turkey's Foreign Minister Mevlüt Çavuşoğlu said on Friday, warning that a possible military solution in the northwestern city of Idlib would be a "disaster." Speaking to reporters in Moscow after meeting with his Russian counterpart Sergey Lavrov, Çavuşoğlu said: "Preserving the de-escalation zone in Idlib, Syria is important in both humanitarian respects and the fight against terrorism." Stressing that more than 3 million civilians live in Idlib, he said: "A military solution there would be a disaster. It would be a disaster not only for the Idlib region but also for the future of Syria." "Separating the civilians from the combatants in Idlib is important for everyone, but a solution through force would lead to a new wave of refugees and a humanitarian catastrophe," he warned. "A solution by force in Idlib would undermine the trust between Russia and Turkey as well as the trust of the cease-fire participants." The foreign minister also said that radical groups in Syria's Idlib disturbed moderate the opposition and civilians, adding that they caused difficulties while Turkey was establishing observation points agreed in Astana process. "It is necessary to work in the Astana format on the [existing] cease-fire, it is necessary to work on promoting the political process," he said, referring to the process that began in Astana, Kazakhstan. Representatives of the guarantor countries for the Syria cease-fire -- Turkey, Russia, and Iran -- will meet with Staffan de Mistura, the UN's special Syria envoy, on this point in the near future, added Çavuşoğlu. The issue will also be discussed by the three countries' presidents in Tehran in September, he said. Çavuşoğlu also said the political process in Syria should be started as soon as possible. Stating that a list of member candidates for a constitutional committee was summited, Çavuşoğlu said: "Establishing a constitutional committee immediately is important for Syria's future. We back this process." The situation in Idlib is also set to top a meeting between the Russian and Turkish foreign and defense ministers and intelligence chiefs. Located near the Turkish border, this May Idlib was designated a "de-escalation zone" where acts of aggression are expressly forbidden. Syria has only just begun to emerge from a devastating conflict that began in early 2011, when the Assad regime cracked down on protesters with unexpected ferocity. U.N. officials estimate that hundreds of thousands of people have been killed in the conflict. Russia and Turkey have agreed to establish a mechanism to restore a visa-free regime between the two countries, Russia's Lavrov also announced. Russia is ready to lift visa restrictions for the Turkish holders of special and service passports as well as for drivers engaged in cargo transportation between the two countries, Lavrov told reporters after meeting with Çavuşoğlu. "We have confirmed Russia's readiness to hold talks on simplifying the travel regime for certain categories of Turkish citizens on a reciprocal basis, and we will do this in the near future," said Lavrov. "We agreed to establish a mechanism for consultations on the development of agreements on this subject." Calling Russia a "strategic partner," Çavuşoğlu stressed the importance of further developing bilateral ties with Russia. "We will both improve bilateral relations between the two countries for [providing] stability and economic development in the region and we will boost our cooperation on regional matters," he said. Without naming any country, he said that some countries and individuals were jealous of Turkey and Russia's close cooperation and friendship. 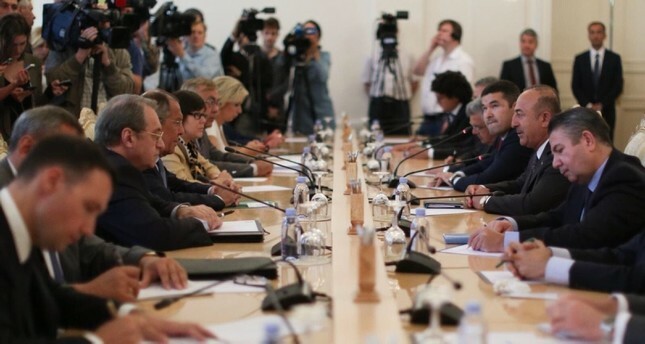 Çavuşoğlu also expressed pleasure at the growing number of Russian tourists visiting Turkey. "We will be very happy to welcome some 6 million our Russian friends to our country this year," he said. 2019 will be declared the Year of Culture and Tourism between the two countries, Çavuşoğlu said, expressing hope that this will serve to attract even more Russian tourists.